This is not a book about Britain, Fintan O’Toole insists in his introduction. Scotland and Wales are largely and deliberately absent from it because, he argues, “Brexit is essentially an English phenomenon”. It is, however, a book with something for the many – for puzzled citizens wondering how we got into this Brexit mess, for academics looking for new ways to understand the phenomena that caused it, for political pugilists seeking new ammunition. The latter group, I’d argue, is the least likely to read it in the spirit in which it was written. It challenges us to reboot our thinking on history, myths and current political discourse, particularly regarding England and its self-perceptions but also about how those affect the rest of us. O’Toole challenges our assumptions, even in the anticipation. A passionately anti-Brexit friend said she’d order it but feared it would make her feel bad about being English. His claim that “England and Ireland are no longer the two opposite poles of nationality on these islands – Wales, and in particular an unsettled Scotland, are much more assertive parts of the matrix”, looks bold. As one Plaid Cymru member remarked to me, this is pretty flattering to Wales, which seems anything but assertive from the inside. But O’Toole’s insistence that Wales is a separate case should not come as a major surprise to anyone who has been taking an interest in analyses of Brexit voting patterns or public opinion. Recent research by Cardiff and Edinburgh universities found that e.g. a clear majority of Conservative voters in England think that jeopardising peace in Northern Ireland or even losing NI or Scotland would be a price worth paying for Brexit. While Leave won a majority in Wales, there were interesting variances in the voting pattern, as Prof Richard Wyn Jones’s research and regional results have shown: Welsh-speakers and voters in west Wales were much more likely to favour remaining in the EU than their more easterly co-citizens. Prof Wyn Jones was also an early proponent of the argument that a growing sense of Englishness is changing the UK, warning a Westminster cross-party committee as long ago as October 2016 that “what was driving the Brexit vote was… a sense in England that England is being ignored within the UK”. So perhaps we shouldn’t be too hard on the Welsh, or on O’Toole’s omission of Wales from this particular polemic. Don’t blame the Irish either, as Brexiters do frequently and with breathtaking ignorance of the history between these neighbouring states. An ignorance that also characterises their attitude to English history, according to Fintan O’Toole, who recounts lively examples of how myths are mistaken for reality. A growing sense of Englishness – a coming out as English – has taken on a momentum of its own in the 21st century, with growing numbers identifying as English rather than British, O’Toole says. In the 2011 UK census fully 60% in England identified as English rather than British, rising to 70% in North East England – in contrast with just 37% of Londoners. This rising English nationalism “was different in many ways from the Scottish and Welsh varieties” including in perception of EU influence. Asked to identify which layer of government had most influence over their lives the 8% of Scots and 7% of Welsh cited the EU. The proportion was 31% in England. The central thesis of ‘Heroic Failure’ is that the Brexit chaos is about England, its resurgent identity, its selective take on its own history, and a national self-pity based on an interesting reversal of reality. Another factor the author identifies is sadopopulism, a concept he associates with punk: “it is in punk that we find, not just the nihilistic energy that helped to drive the Brexit impulse but, more to the point, the popularisation of masochism”. But we’re left with another mystery, of the bond “between working-class revolt on the one side and upper-class self-indulgence on the other”. And with the worrying thought that “the need to hurt someone else is the dangling, unfinished business of Brexit‘s sadopopulist project”. In this and other parts of his thesis, O’Toole singles out the “breathtaking nature of the shift in self-image”. He could also have legitimately suggested that Remainers failed to understand the nature and provenance of the Leave campaign, even that their arguments were too serious to be taken seriously by people who liked the style of Johnson and Farage. If they are to win a possible future referendum they could do worse than get to grips with the “fundamental tension in Brexit – the profound differences in the self-interest and ideology of its leadership on the one hand, and the actual interests of their working class followers on the other”. After all, all the main Brexiteers are Brexit-proof. Few get off lightly in ‘Heroic Failure’. It is no paean of praise for the EU. Being angry about the European Union isn’t a psychosis but a mark of sanity, O’Toole argues, citing the “slow torturing” of one of its own member states, Greece. While he considers that working-class communities are right to feel abandoned – “The distress is real. And Brexit gives the pain a name and location… but it’s still self-harm” – he has parts of the Left in his sights too. For them “it has been convenient to think of the EU as the vector of neoliberalism, as if Thatcherism (and the failures of the Left that contributed to its ascendancy) were an unEnglish aberration”. This leftist anti-Europeanism has paralysed Labour’s response to Brexit. Some Labour Party leaders were secretly pleased that Brexit would allow the building of socialism in one country, while “on the Tory right, German moguls were, for a brief shining moment, not oppressors but saviours”. And O’Toole has a daunting suggestion: for many of the elite behind Brexit “the exit from the EU is really a prelude to the exit from the nation-state into a world where the rich are truly free because they are truly stateless”. O’Toole helpfully shares examples of the ideological position of leading Brexit figures. Some are familiar to us but others perhaps less so, such as William Rees-Mogg who suggests in “The Sovereign Individual” that “democracy will go the way of its fraternal twin, Communism”, with sovereignty passing to super-rich individuals and the death of nation-states. Fantastical perhaps, but possibly revealing. O’Toole variously characterises Brexit as “a strange hybrid – a genuine national revolution against a phoney oppressor” and as “a radical operation on the wrong part of the body”. England is “a divided thing, bitterly split” and, on the evidence of O’Toole’s arguments, changing that state will be a protracted and fiendishly difficult task, if it is possible at all in our lifetimes. This is a challenging but revealing book which is essential reading for anyone who wants to better understand the underlying tensions that caused the biggest political realignment of the decade. 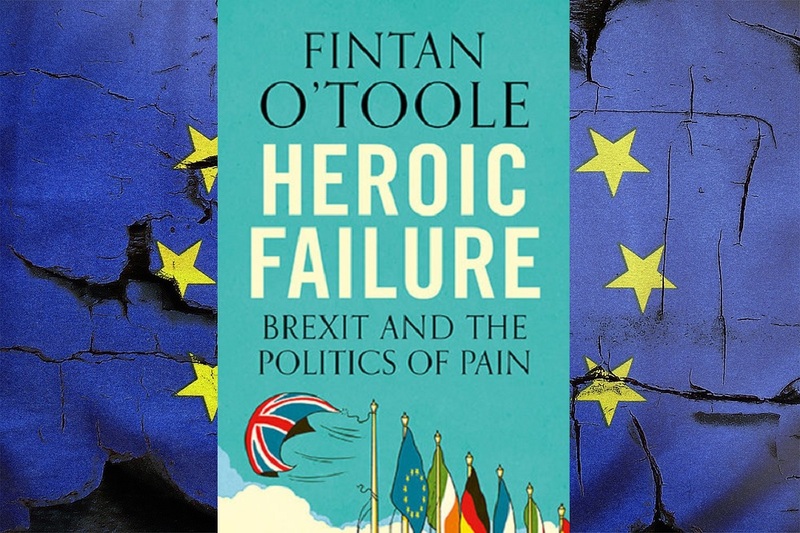 As for Wales, where a majority voted to leave the EU, and the evidence does not yet point to a significant reversal – perhaps we can hope that Fintan O’Toole will soon turn his attention in our direction.